The Roos family lived next to the Koopmans family at 10 Woldstraat. Salomon had his drapery business and besides this he would go to the farmers with ‘het pak’ (‘the package’) which was usual at the time. He went to clients in the surroundings of Meppel with two big suitcases tied to his bicycle. Especially Staphorst was good for business. On Thursdays people from Staphorst would come to Meppel, because then the rolls of materials were laid out on the tables outside the shop. Salomon Roos was born in Staphorst in 1889; he married Anna van der Sluis, also born in Staphorst in 1891 (daughter of Salomon van der Sluis, who had a big export slaughterhouse on Ezingerweg). They had four children. Henri the eldest was born on the 19th of August 1920. After primary school, he went to technical school, studying technical engineering. After this he trained as an instrument maker in Delft at the Kamerlingh Onnes Institute. Even during the war he was employed as an instrument maker in Leiden. Eddy Sally was the second son of Salomon and Anna. In 1939 he was 18 years old; he had completed HBS (high school) and was employed by Meppel local council. In 1940 his career came to an abrupt end, when Jews were removed from civil service. Eddy Roos and Henry Roos. Then there was daughter Amalia (Lia). When the war broke out, she was 16 and had just finished the school for Domestic Science. Her occupation was home seamstress and most probably in these precarious times, she came to work in her father and mother’s business. There was also a late arrival: Rudi (born in 1937). He did not have the appearance of a Jew; like his father he also had blond hair. 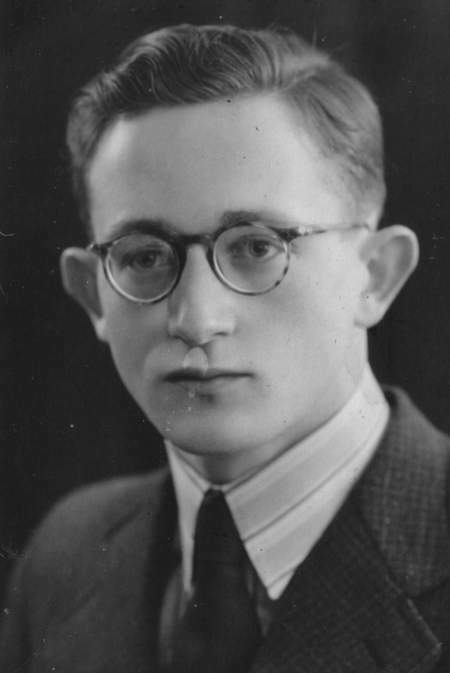 The Roos family had to suffer the same indignities as all the other Jews, the closing of their business, confiscation of all supplies and Abraham being sent to work in labour camp Orvelte, soon followed by the disappearance of Eddy, who had to go to Linde and after one day was taken to Westerbork. From there he wrote a moving letter to Ali Wolf, the girl next door. When you see this cross above my letters, don’t answer them directly. It is illicit then. Yes, finally I have time to write. It was probably a shock to find out that we had to go to Westerbork unexpectedly. It’s not all that bad here; the food and the treatment are good. The only annoyance is how dominant the German Jews are behaving. They threaten to tell things to the military Police or the SS, but there are only a few like that. Most of the time things are all right. We are sitting on a corn-stack. No girls here! Next to us a group of Germans Jews is singing. In the evenings we can do what we like. We arrive back from work around six o’clock, then have a wash, because we smell of grease. We get awfully dirty anyway, because they only wash clothes once a month and it takes a long time before you get your things back. We cannot afford to be without clothes in case we have to leave for Germany. Six thirty finished with washing .Then I pick up my meal. In order to get your meal, you have to collect a numbered card and when you hand it in, you receive your meal. Sometimes we get a bowl of soup with our stew. It’s a damned trouble to get it all. The Amsterdam Jews are cads, most of them just riffraff. In the barracks there are three beds above one and other, no room to sit, nowhere to store your things. The beds are extremely dirty. We got one sheet, one pillow case and one blanket from the camp; luckily these are reasonably clean. Leon de Vries is my room mate; that’s not bad. Loekie is a bit further up. We are all spread around the room, which fits 200 men. At the moment it’s nearly full. The toilet is great to see but not to smell. When Bennie saw it for the first time he said: ‘It’s just like a ‘sour cart’ in Amsterdam. Twenty of those things next to each other; that is what it looks like. All next to each other. [then follows a drawing of twenty toilets next to each other, and on both sides a long row of urinals, TR]. Crazy, isn’t it? You should see them sitting there in their bare bottoms; you’d die laughing. But you get used to it. By the way, they have not seen me there yet! I often go round the back. The work is heavy, but I can do it. We don’t rush. I hope you’ll hear from me later on. Thanks very much for your entry [? TR]. Best regards, see you soon. 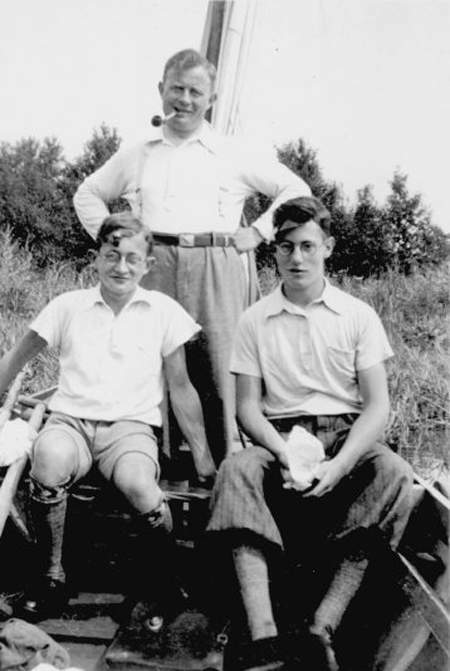 Textile trader Salomon Roos with his sons Eddy and Henry in 1936. While Abraham was in Orvelte, Anna had to suffer the humiliation of going to the Chamber of Commerce in order to report that their business was in liquidation. This happened on the 23rd of July 1942, ordered by Richard Becker, who was responsible for the files at Omnia. The business was officially liquidated on the 18th of February 1943. The whole family had already disappeared then. I was shocked by your telephone call this morning, but actually I was prepared. I did not say anything last week but I was afraid that they would be sent away, only I did not think it would happen so fast. Did Eddy receive things like warm underwear, a water bottle and a rucksack, or was it not possible to send such things. I have found a couple of water bottles here and had hoped to get more things for Eddy, but it seems to be too late. I am convinced that everything will end quickly to our advantage, and that we will soon be together. Only I am afraid that for some it will be too late, if this goes on too long. How is mama carrying on? She is probably very nervous! Lia is probably feeling awful. Is there anything I can do for them? I have asked for a permit but I am afraid that it won’t work, because I already had one last week. Please write and let me know how mama is and Lia and in general how things are at home. That same day, it was a Sunday morning, Eddy wrote a farewell letter from Westerbork to all his beloved ones. He put on a brave face, but it must have been very hard for him. 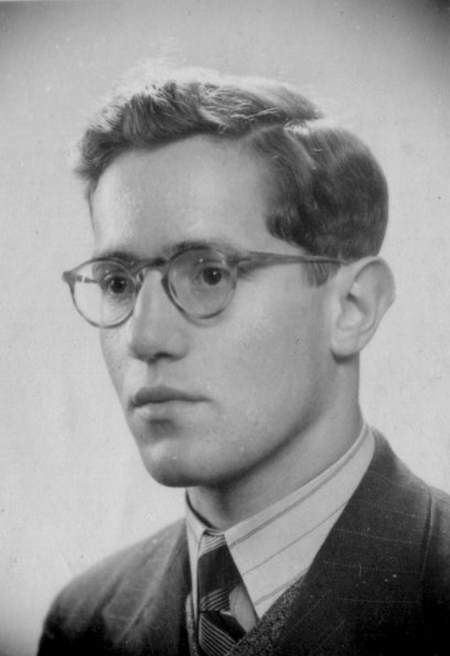 Eddy disappeared to Auschwitz on the 24th of August and was killed on the 30th of September. On the 2nd of October Abraham came home again, on leave from the labour camp at Orvelte. Typically German: to think up something nice and to follow it up with something unpleasant. He had hardly arrived home, when he heard the rumours which could not be stopped: ‘The Jews are leaving tomorrow’. When Rudi escaped into the street to play, his father shouted: ‘Rudi, you have to come inside, you are not allowed to walk there anymore’. People tried very hard to help the Roos family to go into hiding. 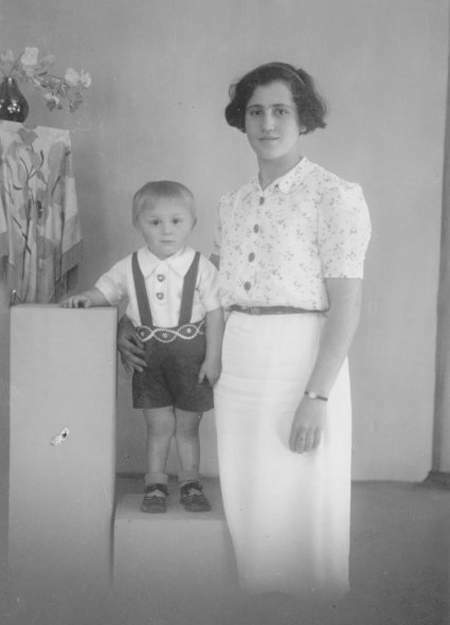 As father and Rudi were not of Jewish appearance, they would have a good chance of surviving the war. But whatever people tried, the family refused to go into hiding. in the labour camp in Orvelte. Saturday was the fatal day for the Roos family; all four of them were taken from their beds and deported to Westerbork. 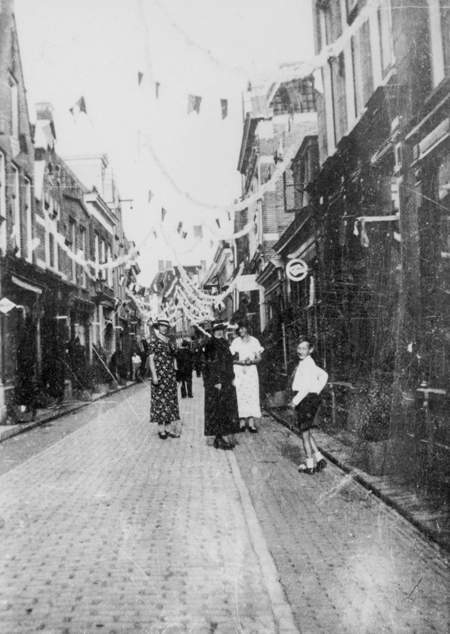 As he could not return to Leiden at once, he had to spend the night somewhere else; with the Polak family, on the corner of Woldstraat and Hoofdstraat. Mrs Polak was old and seriously ill, which was the reason why she and her husband were not transported to Westerbork. The following day Henry returned to Leiden. Salomon, Anna, Rudi and Amalia were transported from Westerbork to Auschwitz on the 5th of October, where they were gassed on the 8th of October. By mid-May Henry was picked up and sent to Westerbork. On the 24th of May 1943 he was killed in Sobibor. After the War the brother of Salomon Roos came from Amsterdam to the Koopmans family, inquiring if there was anything his brother had left behind. In the cellar under the shop they had hidden a dinner service, which they gave to him.